It is fitting, in a way, to read Foucault's Pendulum after finishing a Dan Brown novel. After all, Umberto Eco represents the exact opposite of Brown's book: he is hyper-academical and dedicated to getting the smallest details absolutely right. Brown on the other hand is dedicated to creating misleading interpretations of pseudo-facts and weaving them into absurd thrillers. I'm guessing, however, that you already knew that. Not everything is that simple. Dan Brown's novels typically do represent major topics of the 21st century and do take readers on imaginative journeys through the old world. They make for easy-reading summer blockbusters; don't think too much, just rush forward toward the inevitably disappointing ending. But what the hell, the ride is always worth the effort. 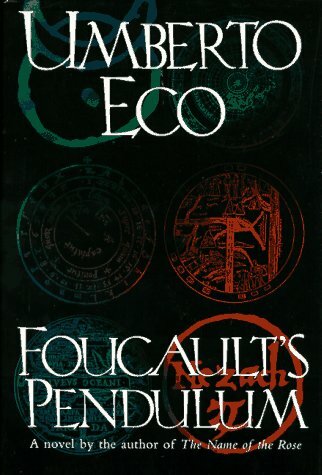 Foucault's Pendulum on the other hand is not a giddy summer read. I felt that it would have been better as a non-fiction piece or even an academic paper because a novel it is not, at least if measured in terms of actual story or character development. Just like The Name of the Rose, there are essentially no female characters. There seems to be a story in here somewhere, but it takes most of the book just to set the pieces moving. There is talk of Templars, Hospitalers and god knows what other secret societies, but the story itself is not about any particular conspiracy. The book's dust cover describes it as if it was a thriller, but there is barely anything actually happening. The message of the novel is this: secret societies and conspiracies are made up by fraudsters, faux-priests and idiots. These characters are colorful, but at the end of the day feel empy. There is nothing to learn from a conspiracy. At times I felt lost in the exposition and could not help feeling stuck inside an encyclopedia. And just like encyclopedia, this book is an artifact of a not so long ago past. Foucault's Pendulum might have been cutting edge on publication, but now the references to computers and intellectual jibber-jabber felt old. It was only fitting that I happened to buy it from a used book shop.